Last Friday, Apple has unleashed their latest operating system, OS X Leopard, and from the general reactions and first reviews it appears to have been very well received. I’ve made the upgrade and would like to now share my own thoughts and experiences I’ve had with this new system, and whether I would recommend current OS X users to part with their hard earned $129 to get the latest and greatest offering from Apple. Leopard looks fantastic. Apple have refreshed the user interface (UI) in order to give it a much more modern and sleeker look. This is a much needed update, and many of the older icons and elements have been upgraded to better reflect the design of Apple’s new hardware, which uses aluminum as a main material. “Aqua”, as the UI is (was?) called, is not dead however, and there are still bits and pieces throughout the UI which retain the liquid look and feel, such as the scroll-bars and certain push buttons. I was at first skeptical about this and wished Apple would refresh the whole interface and get rid of the watery elements, but in the end, I think the gray metal and light shiny liquid effects work well together in the Leopard interface and provide a very satisfying use experience. Leopard also makes use of its new technology called Core Animation. This allows for better animation of UI elements. 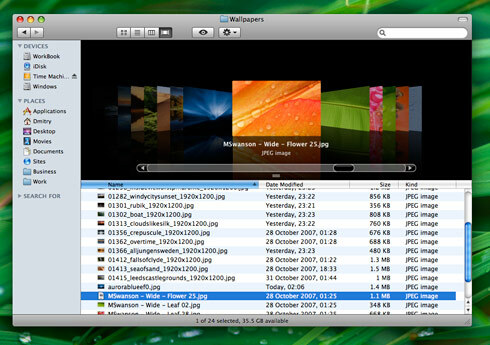 Subtle animations have been incorporated into many places, for example the way the Dock’s stacks gently fan out, or the smooth zoom-in and zoom-out transitions when you view pictures and documents in Preview or QuickLook. Animations help tie the experience together and make the whole system feel more fluid and real. You don’t just jump to a different size picture when you click “zoom in”—you actually see the picture zoom in. It works, and it has been done very well in Leopard. It’s all fine with looking great—but does the system include any powerful upgrades to its functional elements? Are there any technologies and programs that could significantly improve your work-flow? The answer is yes, there are a few—but not a lot. This isn’t so much a negative point, but I’d like to say that Leopard is very much an evolutionary upgrade, which means that there are a few good additions and many improvements and polishes. There is nothing radically new, but there doesn’t have to be. Let me outline a couple of things that you may find useful—features I am using right now that I feel have really helped improve my work-flow. Spaces. 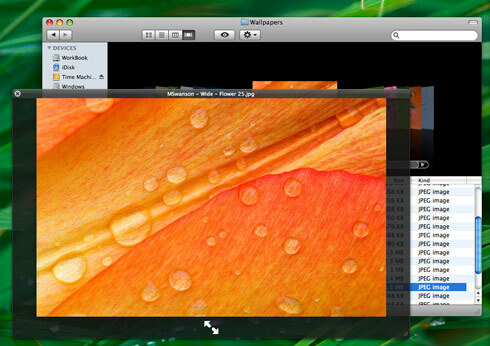 This is the virtual desktop management for OS X. Spaces is the best virtual desktops application I’ve used—those of you who are used to something like Virtue Desktops in OS X Tiger will be very pleased with Spaces. For those of you who aren’t sure what virtual desktops are, let me explain. 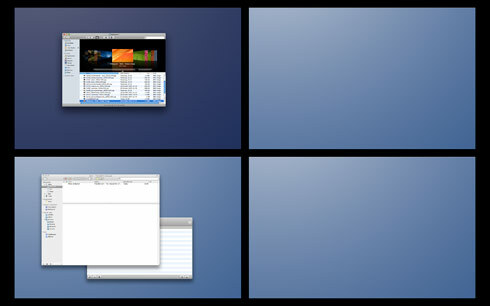 Virtual desktops are basically desktops. You are working on a desktop right now. Imagine you could press a button and go to a fresh, clean new desktop, with no windows open. Open a few new windows on that clean new desktop—and then click a button to go back to the original. You now have separate programs opened in two different areas, and at the press of a button you can switch between them. This is fantastic for de-cluttering desktops, especially if you work with many programs and windows open all the time like me. One desktop to check email and communicate in, one desktop for web design programs, one desktop for Photoshop…and so on. Spaces runs fast, is very easy to use and is very useful. Time Machine is another nice new feature in Leopard. Time Machine allows you to back-up stuff on your Mac automatically, without having to do anything. Just plug in a hard-drive and click the big “ON” switch in Time Machine. From now, your hard-drive will be backed up automatically every hour. If you like, you can tweak settings and exclude files from being backed up. The interface and ease of use is fantastic—this really is a true plug and play backup solution. Restoring files is also very easy and comes with its own “going back in time” effect. It’s over the top, but its also fun to use. The Finder has been refreshed. Gone is the old brushed metal look. The Finder now looks very similar to iTunes, and even behaves similarly, with a new CoverFlow mode built in which you can use to visually browse your files. If you tap the space bar key, you can open files instantly in QuickLook to see previews of documents, pictures and videos (you can even read whole PDFs in QuickLook). Very useful. Probably the most interesting thing I found is that Leopard runs faster than Tiger. The whole system is much more optimized for the new Intel processors. Spotlight now finds applications instantly (no, really…instantly) and only takes a second to get the other search results—you really have to see it in action on your computer to experience its new speed. Everything runs very snappily and quickly. Having a relatively “old” Macbook Pro I didn’t expect a boost in performance from Leopard and so was pleasantly surprised. Now that the interface and the desktop has a new and modern look, and the system runs faster than the old Tiger—Leopard just feels nice to use. I think Apple have done a fantastic job on building a great user experience with their new operating system. Is there anything in Leopard I didn’t like? Only one thing is currently on my mind that I didn’t like, or rather, I expected more from—and that’s Apple Mail. Mail now includes to-do lists (shared with iCal) and notes. These are supposed to help you stay more organized, but they really are not powerful enough to use as an organization system. The reason for this is that each to-do task can only be linked to a calendar. There is no way to add things like contexts or projects to this—or make sub-lists of tasks. As it stands, Mail’s notes and to-dos are only useful for really casual users, and I don’t think they’ll be useful for keeping people organized. Implementing something like a GTD (Getting Things Done) system seems impossible with the current setup, so I’m going to have to look elsewhere for this. Other than that, Leopard is a fantastic upgrade. There isn’t anything that revolutionizes the way you work—everything is an evolution to your work-flow. Things like Spaces, Time Machine and the new Finder will make your life easier. There are over 300 updates in Leopard—pretty much everything has undergone a polish of some sort. I think these updates, together with the added technologies (like Core Animation) and performance optimizations definitely make Leopard a must buy for Mac users. Nice, I that the upgrade was a swift process for many people but some also experienced problems so it’s good to see that you had a smooth transition. I look forward to switching to a Mac work flow and will be proud to have Leopard a part of it. Sure, there’s always problems and most of the people posting on the net would only post if there was a problem they wanted to solve :) In comparison to Vista launch or other OS X launches I think this one is relatively painless and there has been generally a lot of very positive feedback around the Mac community.